Reverse Osmosis System rejects 97 – 99% of total dissolved solids by the principle of `Osmosis’. This system consists of a R.O. Module assembly mounted on S.S. Skid. High pressure rating FRP Pressure Vessel is fitted on the skid which houses spirally wound membrane elements in series. 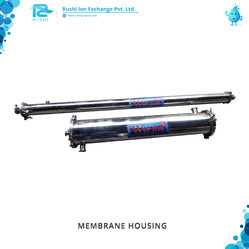 Being perfectly shaped and swift movement of our organization, we are instrumental in offering wide gamut of Membrane Housing. This housing is manufactured using supreme grade material and advanced techniques in adherence to set industry norms. Our offered housing is suitable for cleaning water for industrial and domestic purpose. Clients can avail this housing from us in different specifications as per their requirements. Being perfectly shaped and swift movement of our organization, we are instrumental in offering wide gamut of Industrial Membrane Housing. This housing is manufactured using supreme grade material and advanced techniques in adherence to set industry norms. Our offered housing is suitable for cleaning water for industrial and domestic purpose. Clients can avail this housing from us in different specifications as per their requirements.